Is It Time For the Team To Get It Together? 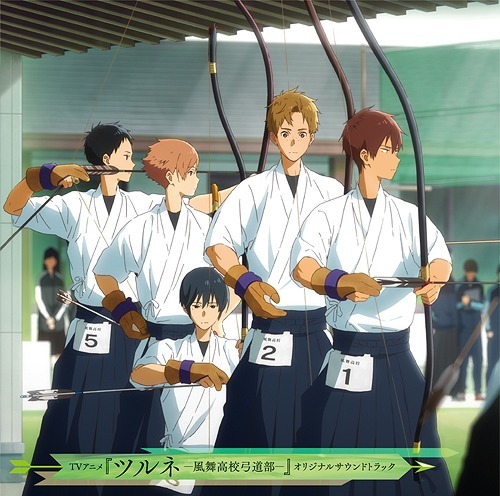 Tsurune as a sports anime has remained a bit of an oddity. Sure the boys do spend a lot of time drawing their bows and practising but realistically whether they win or lose in this tournament has been made utterly irrelevant by their character journeys and their own desire for self-improvement. Seo, as the only female character getting any kind of time with archery, says herself after getting knocked out that she’s satisfied that the result reflects her current level of ability and leaves it at that. Last week the episode left us with the bomb-shell that Masaki had been in a car accident and after a tense week of waiting and hand wringing to find out if he was okay, the start of this episode leaves us with a big, we don’t know. It’s a realistic answer but it means that stomach squirmy feeling that we’ve had all week while waiting to find out what has happened continues and it colours every sequence of the tournament until the end when they finally tip their hand (note to every other anime ever, this is how you use an emotional cliff-hanger). That makes the reasonably mundane events of this episode all take on a certain urgency and whether it is Minato’s initial plunge into self-blame immediately cut off by Seiya (who after his own brief bout of self-pity a few episodes ago has come back even stronger as best boy). But it is the girls, whose names I don’t even remember because they’ve had so little to do in this series and so little development, that actually really step up to the plate when the boys are all staring at their phones and panicking. It is a fantastic scene and one that was definitely needed. It also really makes me wish the female characters got to be more than emotional support or commentators more often in this series even though I know the focus is the male team. You rock even though I cannot remember what your name is. Kaito then tries to rally them and reminds them to use what Masaki has taught them in the tournament. This gets them motivated but they still struggle through the early rounds. Ultimately it is an insight by Minato that turns it all around but as usual his poor communication skills almost blow the team apart (fortunately he holds his ground and makes himself heard). The final round of shooting this episode is a sight to behold and it is one of those moments in anime where you can cry an cheer simultaneously with the episode ending out on the team and audience finally finding out what is up with Masaki before the episode ends. With one episode left to go, I’m just kind of hoping this gets a follow up series though all things considered I don’t know that it will. I do know that I’ve loved following this anime this season and I love this team. It isn’t just Seiya who is having to deal with his emotions this week. We see the ripple of Seiya’s absence as well as his words to Masaki go through all the members of the team and each one has to deal with it as well as their own issues. Of course Tsurune is up to the challenge of dealing with this much drama and doing it with style. While this might be the most emotionally charged episode yet, it still feels genuine and that is reinforced through so many small moments that are instantly relatable to viewers. As someone in my 30’s, Masaki’s moment was probably the one that hit home the most. He regrets what he said to Seiya, he remembers how it felt to have a similar question asked of him, but he doesn’t know how to fix the situation. He feels let down because somehow when you are a kid you kind of feel like adults have it together and have the answer and then you become an adult and realise just how much you just pretend to have it together because it is expected you will. This moment between Masaki and Tomi-Sensei when they sit and drink together after the students have left is a quiet moment but all the more powerful because of how true it rang. And that moment wasn’t the only one. This episode has Onogi talking to Minato about Seiya and while he frames his concern as self interest (he’s worried about the impact on the team in the upcoming competition), it is clear that Onogi is looking out for his team-mates. The conversation between Minato and Onogi is fantastic because Minato becomes clearly aware that he’s dropped the ball with Seiya and then spends the rest of the episode thinking of how to fix things. And even then, it isn’t some grand gesture that ultimately works. A return to childish form of writing a message on the chocolate box gets Seiya out of the house, though heavily prompted by the dog (and does Kuma get an award for most valuable player this week). Still, it is Minato’s absolute honesty, using Seiya’s own words, and just being there for him that eventually gets things back on track. I loved the ending when Masaki apologises to Seiya and Seiya tells Masaki again that he hates him, only the tone of the scene is so different from just one episode ago where the same words were said. It is amazing how different the two scenes feel even though Seiya’s dialogue is identical and that shows just how much impact the events of this episode have had on Seiya. Of course, I do need to mention the shrine visit where the two teams encounter one another. While the twins and Onogi seem determined to have some kind of rivalry going for whatever reason, the rest of the team members seem content just to get on with things. There’s some interesting dynamics between individual characters and Shu remains and enigmatic but interesting part of both Seiya’s and Minato’s pasts. Very much looking forward to more of this. Tsurune continues to be consistently good at building up the individual drama for characters. This week the anime turns its attention firmly to Seiya, Minato’s childhood friend. Last week Shu taunted Seiya a little bit and apparently his words have shaken up the usually calm and stoic character as his shots are now all over the place. However, there’s more than archery on Seiya’s mind as he deals with Minato’s sudden resurgence of personality and energy. This episode is one long and slow breakdown of Seiya’s character and the walls he’s built around himself and by the time we get the confrontation between Seiya and Masaki, beautifully understated as usual, it is clear that Seiya is either mourning the distance that has opened up between Minato and himself, or he’s upset that he wasn’t the one who was able to help Minato get back into archery in the end. Both are pretty understandable and given Seiya is only a teenager, his inability to deal with this kind of emotion makes perfect sense. When you throw in that the episode weaves in some of Minato’s story showing him getting a medical check up in the present and a little bit of the accident, what you end up with is a fairly affective episode, provided you don’t mind feeling like ending on a little bit of a downer because we kind of leave things at an extreme low point. Another nicely done episode and one that was pretty to watch as we’ve come to expect. The Okonomiyaki cooking scene was great fun and the inclusion of the girls here was good, though as normal they get a few lines and then end up on the periphery. Still, even though the focus is Seiya the rest of the team are not neglected and we continue to move steadily toward the next hurdle for the boys. I don’t think I’m ever going to get tired of the animation they use in this for when Minato fires a beautiful shot. Admittedly, we haven’t seen much of it due to his target panic, but this episode really did convey perfectly just how beautiful his shots can be. I was right with the spectators sitting in awe after watching that arrow fly through the air, the feathers spinning, before it struck in the centre of the target. To say that Tsurune maintains its status as an incredibly beautiful anime is an understatement even if most of the time it isn’t rubbing your face in it. It’s the small details that keep this one pretty even as we see some fairly mundane sequences of characters sitting and talking. Though, it would be a mistake to believe that prettiness is all this anime has going for it. In eight episodes Tsurune has managed to really make me care about these characters, and this week even Nanao, who has been by far the one I’ve known least about or cared least for, managed to make me pay attention to him as he played his role within the team. The fact that Nanao is aware he’s playing a role makes him an even more interesting character and I have to wonder why he is so fixated on Onogi and what happens when Onogi doesn’t need him anymore to help balance himself. Of course, the same questions can be, and should be, aimed at Seiya in regards to Minato. Despite this episode focusing largely on the team shoot at the tournament, which the boys first did fairly poorly in and then, through some team bonding and self-reflection improved for the second half, really the story here is about the characters. We get excellent moments for Ryouhei, between Onogi and Nanao, Nanao and Minato, Minato and Onogi, and finally Seiya and Shu. Each one slightly revealing and each on interesting on their own. The boys did qualify for the next round but it was nearly beside the point by the time that was revealed. The progress they individually made and made as a team made everything worth it and honestly I don’t think I’d have minded if they just had to start again next time. Still, looking forward to what they do next because I’m really enjoying getting swept away by these characters.